So sadly, Summer is nearly coming to end and all of the Autumn fashion is starting to come in to the shops. 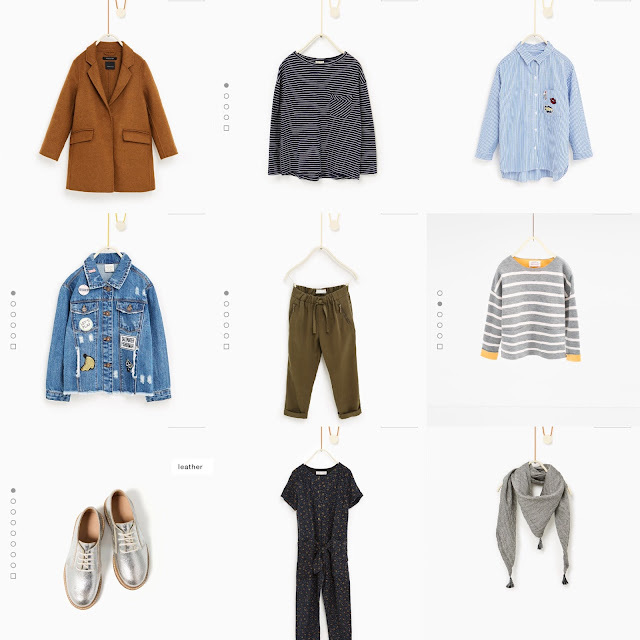 For someone who can't keep looking at clothes online and thinking about how much money to save to buy them, picking out my wishlist for the colder months wasn't hard. All of these clothes are from Zara (one of my fave shops) and I shall leave a link to every item down below. I thought this camel coloured coat would go with anything and would be a staple item for me when it gets a bit chilly! You can't go wrong with a striped tee! P.s- Zara's basic tops are so inexpensive and super comfortable! Tops, Jackets, Jeans you name it; pretty much everything now has patches on it and I thought I would jump on the bandwagon and join the trend! Why not go all out and get a patches denim jacket too?! I'm really loving the patches, if ya can't tell already! I saw Zoella had a similar black pair from Asos and they looked really comfy so when I saw them in Khaki, I was sold! For a casual look, I would pair them with a grey top and some converse. One of my favourite colour combos is grey and mustard so when I saw this I immediately fell in love and know I will get lots of wear out of it this Autumn and Winter. I thought this jumpsuit just screamed Autumn, with the autumnal coloured flowers on it. And hopefully the Summer trend of jumpsuits carry on during Autumn because I'm still lovin' them. This tassel neckerchief would literally go with anything! I just liked the fact that it had tassels on! I hope you enjoyed this post and maybe it gave you a little inspiration about what new bits you might buy this Autumn. I'm loving Zara at the moment, have have so many good pieces, you've picked out a great selection. I love the denim jacket! Zara is one of my favorite shops, too! The handmade coat looks wonderful, and I also like the denim jacket a lot! I couple of months ago I bought ripped jeans at Zara, it has become one of my favorite jeans to wear.